Going through my Campy drawer, I found this RD in a bag marked Record 8 Speed. No Idea where, when or how I got it. The cage and parallelogram are all alloy. 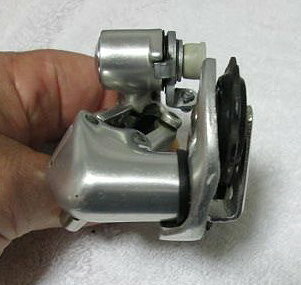 The cable housing adjuster has been replaced with a Shimano one. I'll change that back. My Campy knowledge drops off at the end of the 80's. Anyone know what model this is? Looked through Campy catalogs from the early 90's to the early 2000's. Maybe 1995-early 2000 C-Record? It has 8 Speed pulleys. Next question, what is the rear sprocket capacity? 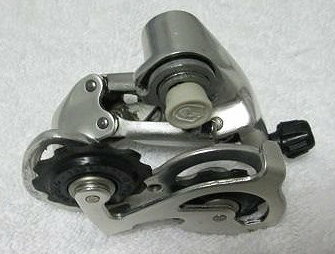 Similar Campy RDs are rated at 26T. Suntour V and Cyclone RDs were rated at 26T too and that was pretty much their limit. I'm running at least 28T or larger FWs on all of my NR and SR equipped bikes and have a 13-31T x 50-42T on one of them. I get all 10 gear ratios. A number of years ago, I was on a CR ride and 2 people were running unmodified NR derailleurs with 34T FWs and one other was running 32T. So, how big can I go? Figuring on friction shifting 50-38T or 50-36T chainrings. It's a 1993 Chorus (Part Number RD-11CH) or a 1994 Chorus (Part Number RD-21CH). In 2004 Campagnolo changed their spare parts numbers from 7 digits to 6 character alpha numeric part numbers. That makes it hard to compare changes between 1993 and 1994. @skillasw Thanks for the heads up. This RD has the same 46mm center to center distance between the pulleys as the Nuovo Record and Super Record RDs. Also the 980, 990, Triomphe and Victory RDs. They're all listed as having a 28T capacity. The straight line distance between the upper and lower pivots on these drop parallelogram RDs is shorter than the NR design which looks like it brings the upper pulley closer to the sprockets. That improves shifting but reduces capacity with the short cage. Last edited by verktyg; 04-14-19 at 05:48 AM. The quick identifier between the Chorus and Record RD’s of this era is the cone shaped pinch bolt on the Chorus vs the slotted hex nut on the Record. BTW, the (several) C-Record models all had an exposed Cage pivot bolt head that matched the mounting bolt head size/appearance. On these later derailers, there is no bolt head on the cage-pivot "A" knuckle. 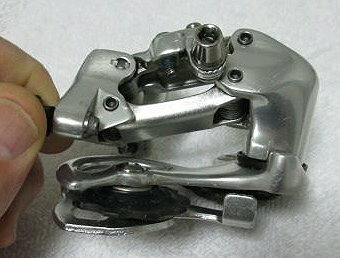 On the later Record 8s model, the pulleys have adjustable ball bearings with large hex shaped dust covers that accomodate thin adjusting wrenches. 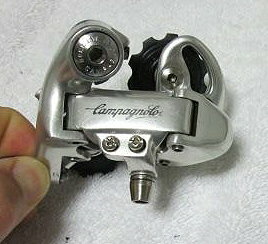 Campagnolo offered both Ergolevers and Synchro-II downtube levers to index-shift your Chorus example. I was going to say mid-90s Athena or Chorus. Definitely not Record. One consistent way to differentiate between the top-end derailleurs from the lower models is to inspect the inner parallelogram plate. 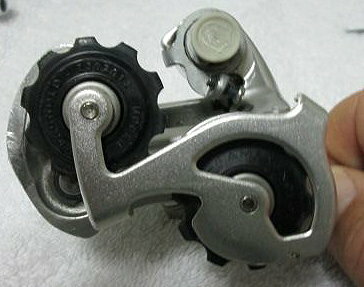 If it is made out of forged alu, then the derailleur is top-end Record). If stamped steel (as in the case of yours), it is second tier. 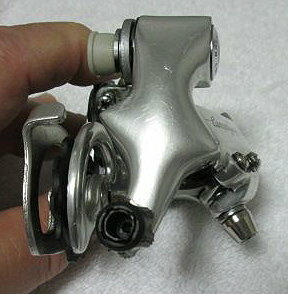 If both cage plates (inner and outer) are steel, then the derailleur (as with Campagnolo Avanti) is lower-end. This screen also works with Shimano derailleurs. Ultegra and above feature two forged alu parallelogram plates. 105 to Tiagra has one: the outer. Below this, the derailleurs are predominantly steel. Of course, the top-end Campy stuff now is mostly carbon. Regarding capacity: I have several of this generation of Campy rear derailleurs on bikes that I use regularly. They handle a 28 rear cog just fine. And there is no difference in 'strength' between the various models, from Avanti up to Record. In fact if anything, I would think that the cheaper versions to be stronger, due to the preponderance of steel sub-components. Regardless, running a too-short chain, and then tearing off a rear derailleur, is not exactly a credible testimony in this thread. Last edited by Dave Mayer; 04-15-19 at 12:12 PM.